It’s only been about twenty-four hours since our last recruiting update went live here at Triple Double Prospects; but as all readers know, the recruiting landscape can change that quickly. In that short time period, we’ve seen two more Ohio seniors make verbal commitments to NCAA D1 schools, while new information has also come to light about some other prospects. Here’s some more scoop to follow up on yesterday’s report…. Darius Harper – ’16 Springfield C: Harper, a massive post from the Dayton area, committed to Miami (OH) on Friday morning, ending speculation as to which sport he would be pursuing at the college level. While many thought that Harper would choose the football route based on his 6’8, 275 pound frame, the Springfield senior’s heart lied on the basketball court. Harper chose the Redhawks over several other mid-major offers on the hardwood and even some BCS level offers on the gridiron. In Harper, Miami (OH) head coach John Cooper is getting a physical paint clogger who has good hands and feet for his size, with the potential to be a pure back to the basket scorer. Conditioning and toning of his huge frame will be key for Harper as he makes the transition from Springfield to Oxford; but expect Harper to get plenty of running in this winter, as Springfield will be among the preseason favorites in the Southwest Region in Ohio. 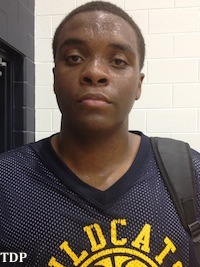 Malik Smith – ’16 Cleveland Heights PF: Seemingly right after we published yesterday’s report, Smith committed to an NCAA D1 school on Thursday afternoon when he pulled the trigger in favor of UNC Asheville. An energetic, strong and athletic 6’6 forward, Smith will earn his scholarship money in the paint as a rebounder and defender as the coaching staff at UNC Asheville will try and develop Smith’s offensive repertoire. Smith burst onto the recruiting scene this July playing with TNBA, as a particularly strong performance at the Adidas All-In Classic really boosted his stock. Choosing UNC Asheville over a multitude of high NCAA D2 offers, as well as NCAA D1 offers from Air Force and Bryant, Smith certainly had plenty of options before settling on heading down to North Carolina. Maishe Dailey – ’16 Cleveland Beachwood SF: Per his high school coach, Dailey, a super talented and late blooming 6’6 wing, will take a year of prep school after high school in hopes of finding a home in high-major college basketball. Dailey, who has over twenty NCAA D1 offers, is capable of qualifying academically for next season, but has chosen to become a 2017 prospect to give himself more time to develop his game and add weight. Andre Wesson – ’16 Westerville South SF: Wesson took an official visit to George Mason this past weekend, as his recruitment still appears to be wide open. James Manns – ’16 Columbus Walnut Ridge SF/PF: Added another NCAA D1 offer, this one from High Point. Last week Manns took an official visit to Bowling Green. Evan Kuhlman – ’17 Lakota East PF: An emerging 6’7 combo forward with a lot of skill and developing confidence, Kuhlman added his third NCAA D2 offer of the fall, this one from Fairmont State (WV), on Friday morning. Fairmont State joins Christian Brothers (TN) and Hillsdale (MI) on Kuhlman’s offer list. Marreon Jackson – ’17 Garfield Heights PG: Jackson’s name has been mentioned a lot this fall, as the 5’8 point guard will be visiting both Cornell and Kent state in the coming days, while he also added an offer from Buffalo. Dylan Swingle – ’18 Paint Valley C: Swingle, a 6’10 center with a huge frame, has received visits from Dayton, Xavier, West Virginia and Ohio State this fall, per high school coaches.